This year I had been reading a lot on Mannerist and Baroque sculpture and painting and therefore I wanted to create a very dynamic duel for GD. As in my Daemon Battle from GD UK 1999 I wanted to have as much going on as possible on a very small base to keep the visual focus on the models and not on the setting. Also I wanted the duel to present an unusual pair by pitting man against man and going for a more subtle painting style. 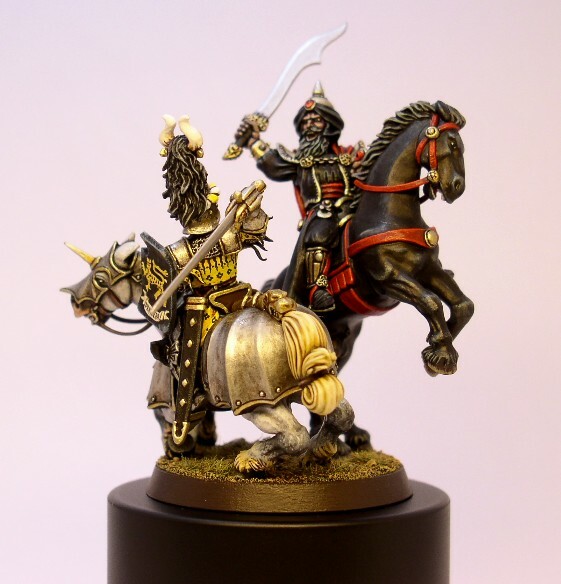 As some will probably notice the imperial knight is a remake of a character from a painting by GW-artist John Blanche, that has been interpreted as a conversion on several occasions. However, Blanche's painting is ifself a reference to a painting by the French Master Theodore G�ricault.